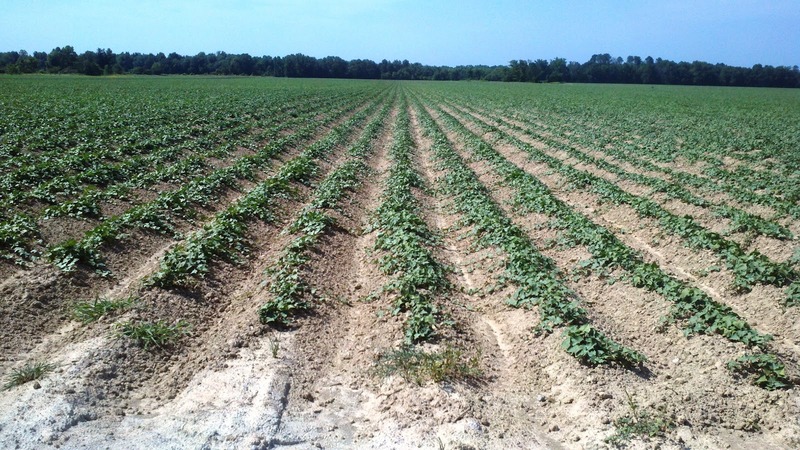 We are working with Perry Ross and some local farmers in Big Creek, Mississippi to see what Effective Microorganisms® will do on sweet potatoes. The soils are mid to low pH at about 6. 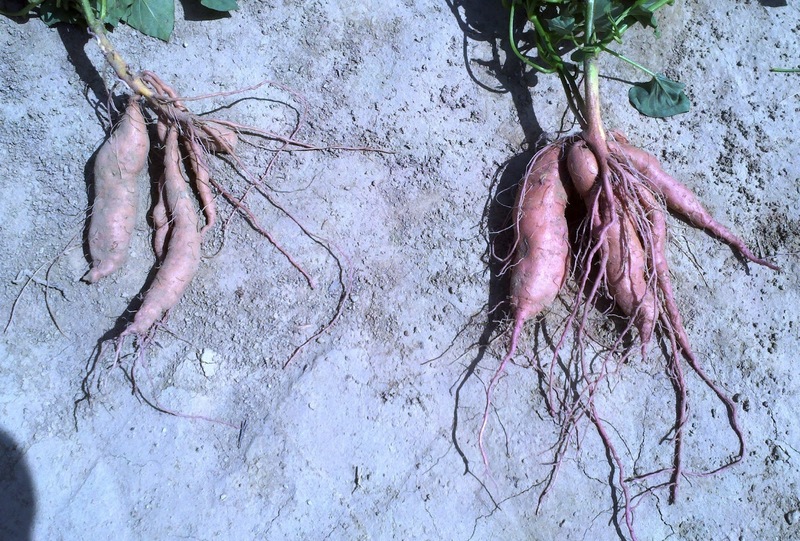 The organic matter is less than 0.5% in a sandy-clay and there are definite salt problems causing the soil causing the to crust and become very hard." . The nutrient program is conventional. Fertilizers are low in nitrogen during the growing season and very high in phosphorus and potassium. 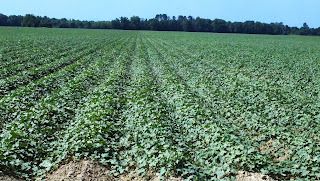 They start with a 10-0-10 (N,P,K) so there is a little nitrogen boost at the beginning. One product they are using is 0-29-15 (Calcium, phosphorus, magnesium). They have not been adding any nutrients to their foliar sprays. Before this trial they were not doing foliar applications at all. The field where the testing is being done is about 110 acres. It has been 5 weeks since there has been rain. There is no irrigation system so the plants have been pretty stressed. There are a couple different tests going on. The soil in the control plot is like concrete! We were amazed that the plants were able to drill through and actually produce potatoes. 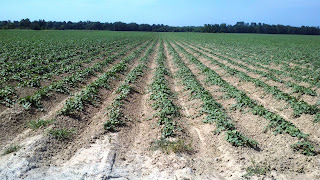 All plots have been treated with the same vegetation management and fertilizer programs. The control has no bacteria at all. 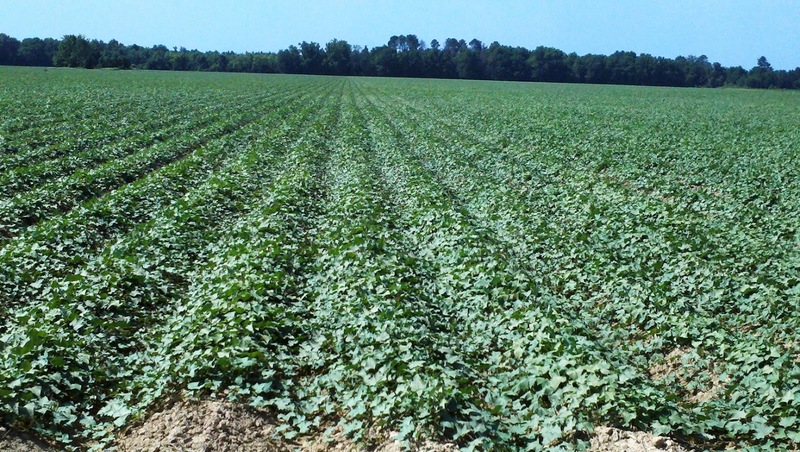 On 30 acres the slips were treated with a 20% solution of Activated EM-1 to water the soil was treated with 9 gallons per acre at planting and they have been foliar sprayed with a 5% solution of Activated EM-1 to water every 10 days in early evening. On 50 acres only the slips were treated and foliar applications have been made, but nothing in the soil (at the same rates as above). Soil treated 9 gallons per acre and three foliar sprays 5 gallons per acre. As we go through the fields (from West to East) there top growth of the plants changes dramatically. All there areas that have been treated with either a foliar treatment of Activated EM-1 or the soil has been treated only are showing less heat stress and considerable top growth. Plants in these beds are growing across rows. Areas where there has been no treatment look stunted and very stressed. We dug up a few plants to see what was going on below the surface. In the video we pulled up crops from each test and you can really see the differences there! Left not treated. Right treated foliar only. Send us your videos and photos about your experiences with EM-1. We'd love to hear about them and show others the potential of their soil.